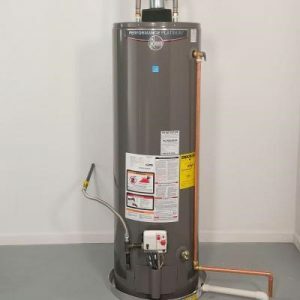 If you are sick of waiting and waiting for your water to get warm, you may need the help of the best water heater installation and repair company in San Diego, the water heater experts at Plumbing and Drains Solutions. We can help you determine if your water heater needs a tune-up, a repair, or a replacement and proudly serve customers throughout San Diego. When water heaters fail, being without hot water might be the least of your worries. Without having a professional diagnosis of the problem, your home or business may be in danger of a flood. Give us a call at (619) 345-5550 if you are experiencing any problems with your water heater. Remember that estimates and even second opinions are always free of charge! As a team that keeps up with the latest advancements in plumbing technology, our San Diego plumbing company takes full responsibility in understanding all kinds of makes and models of water heaters that we service and we will answer any questions you may have. If you are looking for a more reliable and energy-efficient water heater, we are happy to install a tankless water heater in your residential or commercial space. We even offer upfront pricing, which can include the installation and labor of a new traditional or tankless water heater to your existing plumbing. If you have considered installing a Tankless Water Heater, you will know that there are a number of advantages that tankless water heaters offer that can be found nowhere else. First and foremost, tankless water heaters will give you never-ending hot water. Running out of hot water halfway through your shower or while using a faucet will be a thing of the past and installation of this type of heater ensures that you will be able to enjoy hot water any time that you should need or want it, and as much of it as you need at a time so that you can run your dishwasher, take a shower and have a load in the laundry all without a blip in your hot water production. A second advantage to installing a tankless water heater is the very seductive 40% energy savings you will enjoy on your energy bill. These new tanks are designed for maximum energy efficiency, specifically because they only heat the water when hot water is needed. It does not waste energy keeping water hot ‘just in case’ but can instantly heat however much water you need, as it is demanded, a phenomenal advantage that entices more people to make the switch every day. A third advantage to installing a tankless water heater is the performance and long life of these types of tanks. Due to the use of commercial grade copper in their construction, tankless water heaters usually last up to 20 years, and many of them have warranties on the heat exchanger of up to 12 years. This is twice the lifespan of a traditional hot water heater, and a far better warranty. A fourth advantage to tankless water heaters is that they do not store water, this means that the water you bathe and wash your clothes and dishes in is clean with no build up of residue that can accumulate inside of a traditional hot water heater. The fifth advantage to installing a tankless hot water heater is the savings in space. While a traditional hot water heater can take up to 16 square feet of floor space, tankless heaters are normally the size of a small suitcase and can be installed on any wall in your home. 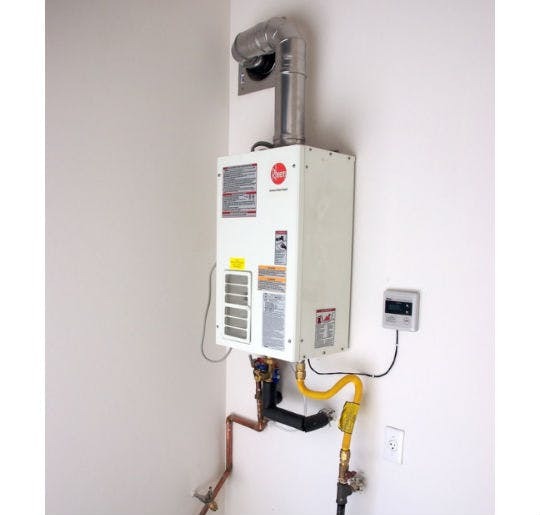 As you can see, the advantages to installing a tankless hot water heater are many and varied, and they are quickly becoming the standard choice for individuals having to replace their traditional hot water heaters due to the simplicity and efficiency of usage as well as the tempting energy savings. If you are looking to replace your traditional hot water heater with a more energy efficient tankless model or have general plumbing needs, contact the experts at Plumbing and Drains Solutions today, they will make certain that our tankless water heater is installed quickly and professionally so that you too can start sharing in these advantages today. You may not always realize how significant hot water is in your home until an issue occurs with your water heater. No matter what the weather may be like outside, we almost always rely on hot water when we shower, wash dishes, and do laundry. Our knowledgeable technicians at the best water heater installation and repair company in San Diego are proud to offer same-day services to help ensure that you never run out of hot water. We are also a fully insured, licensed, and bonded team that offers flat rates. References are available upon your request and your satisfaction is always guaranteed. Call us today for a plumbing service estimate from San Diego’s top rated plumbers. Turn to our water heater professionals at Plumbing and Drains Solutions for reliable and efficient services. Contact us today at (619) 345-5550.